Edinburgh City boss James McDonaugh described Saturday’s 4-1 defeat at Cowdenbeath as his team’s “worst performance of the season”. 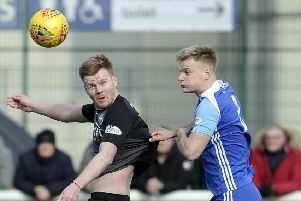 The Capital outfit’s heavy loss at Central Park leaves them six points adrift of Ladbrokes League Two table-toppers Peterhead, who were leading 3-1 at third-placed Clyde with 18 minutes remaining only to end up drawing the game 3-3. The Citizens found themselves 3-0 down just a minute into the second half as Jordan Allan completed his hat-trick. And, although Craig Thomson’s goal six minutes later gave them a platform to build on, David Cox put the icing on the cake for the home men with a fourth of the afternoon with nine minutes left to play. With just four matches remaining, earning promotion to League One via the play-offs would now appear City’s best bet. “It’s got to be better – the standards, work-rate, attitude, everything has to be better,” McDonaugh said. “That was the worst performance of the season and it’s not good enough. We can’t fall to that level again. Many of them are playing for their futures – as we all are – and performances like that are going to give some answers you don’t want. “I think the scoreline was a fair reflection. Cowdenbeath deserved their victory. They were better at both ends of the pitch and they took their chances. We created good opportunities, possibly more than them but they were more clinical. City must now regroup ahead of this weekend’s visit of Clyde. Both sides are currently level on 65 points but the Ainslie Park men do have a better goal difference. Meanwhile, Peterhead host struggling Albion Rovers at Balmoor.